The Back Clinic | What is Chiropractic Care? Our Purpose: Our purpose is to check, educate and adjust as many families as possible towards optimal health through gentle, accurate, corrective care. Our team is dedicated to helping you regain your full health potential and assisting you and your family to stay well for life. Furthermore, we are equally committed to continuing to educate the broader community about the vital role that their spine and nervous system play in the quality of their lives. Whilst people start chiropractic care for many different reasons, our primary goal is not simply to alleviate your pain or symptoms. Instead, we strive to ensure that your nervous system, which can be likened to a "communication superhighway", is able to relay information back and forth between your body and brain. This is of vital importance because your nervous system, which is housed within the spine, controls and regulates all of your body. We choose not to use therapies, treat diseases, or use medication or other drugs. What we do focus on is detecting and correcting subtle misalignments of the spine, better known as Vertebral Subluxations, and educating all of our members who are interested in being their best and reaching their optimum health potential, now and in the future! We do find that chiropractic care often helps cases of lower back pain, neck pain, headaches, sports injury and more. 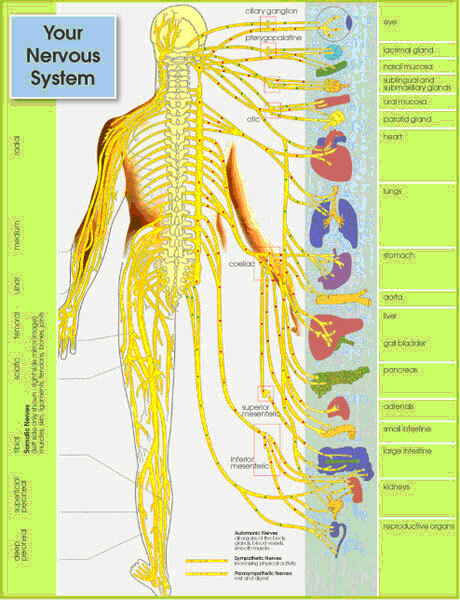 Your communication superhighway, or your nervous system, coordinates and controls every function in your body through vital nerve messages and is responsible for ALL healing, repair and regeneration in your body. Your current level of health is the result of the quality and quantity of your nerve messages. When you have a healthy nerve system, you are better able to handle the challenges of life because you are able to adapt, heal and recover at your optimal best! Vertebral Subluxation results when your spine moves out of its optimal, healthy shape and alignment and places pressure or stress on your nerve system. This results in interruption to the vital nerve messages that run your entire body and causes most of the unwanted health problems that people battle with every day. Physical, chemical, mental or emotional changes in your environment or body can create stress. Any stress that your body cannot adapt to may produce a vertebral subluxation. The combined effect of a variety of stresses and the development of vertebral subluxation can cause you to become 'stressed out'. In essence, your body starts to shut down and gets slower and sicker with every moment that your nervous system is compromised. Because most people have never had their nervous system regularly checked for subluxation from the moment they were born, it's likely that they have never functioned properly their entire life. But until you have something to compare your current level of health to, it's hard to imagine what it would be like to have a mind and body and emotions that are functioning brilliantly. Most people judge their health by the presence or absence of symptoms. Symptoms may occur as soon as a vertebral subluxation is present HOWEVER, in most instances, a person may have subluxation for many months or years without even knowing it. Often we are not aware that vertebral subluxation is present unless a thorough chiropractic examination is conducted. You can't feel if you have Vertebral Subluxation! Only 10% of your entire nerve system carries or perceives pain. Up to 90% can be heavily stressed without any alarms, whistles or warning bells. Furthermore, this is the reason your family members, including infants, and friends should be checked for subluxation. Your spine is the most important factor affecting your posture. In order to have the best possible posture (and health), your spine has to be in the best possible condition. From the rear your spine should be perfectly straight ( figure 1). From the side you should see three curves, each having a 60º arc (figure 2). Science, anatomy, and physics all observe that a 60º arc offers the strongest defence against the destructive forces of gravity and movement. Although your symptoms are an important part of the picture, if they are present at all, they are not a reliable way of measuring your health or if your subluxations have been reduced. Remember that your symptoms are usually the tip of the iceberg. Through a series of re-evaluations, postural exams, educational programs and Xrays, we will over time be able to closely monitor your progress. We take our role as your health and wellness team very seriously. We have a phenomenal move well, eat well, heal well and be well program that will teach you everything you need to know to get maximum results from your care.